Unbelievable: United Nations Orders Trump to Let New Migrant Caravan In! The United Nations was behind all of the chartered buses that carried the thousands of caravan migrants from Mexico City to the US border back in November. Now, the UN is stepping in to provide help for the new caravan set to leave Honduras on Tuesday! 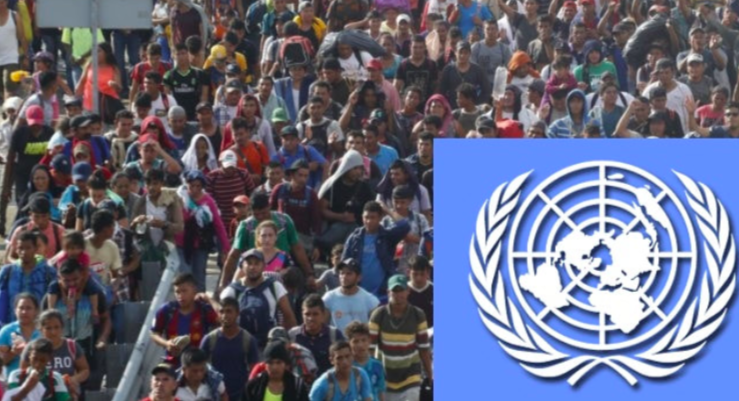 Make no mistake about it: The United Nations is trying to use YOUR tax dollars to facilitate an invasion of the United States' southern border. But thanks to the government shutdown, none of that funding has been disbursed yet. The UN is currently running on fumes. Democrats are promising to push the new State Department Appropriations Bill through and give the United Nations a blank check to help these caravan invaders. You have a chance to stop the UN once and for all, but it has to be right now! Send your instant and urgent FaxBlast to Congress right now before it's too late and DEMAND they block all United Nations funding from passing! A new caravan is forming in Honduras. They will set out on Tuesday to begin their trek to the US-Mexico border. Like the last caravan, this one will have help. The United Nations is already embedding officials into the caravan to coach them on how to game the system and trick US Customs and Border Patrol into accepting their asylum stories. The UN is once again threatening legal action if the Trump administration turns any of these new caravan migrants away. For far too long, the United Nations has used my tax dollars to try to chip away at America's sovereignty. That ends now. With the government shut down, you and your colleagues have not yet passed a State Department Appropriations Act. That means that the billions of dollars earmarked for the United Nations have not been disbursed yet. You have a once in a lifetime opportunity to keep it that way. Pull the plug on the whole thing. Block even one cent from going to the anti-American bureaucrats at the United Nations. Appropriating $5 billion for border security is apparently controversial, but Republicans and Democrats alike don't even flinch at the idea of giving away billions to the UN and its anti-American programs. It is truly shameful. I am demanding that you block this legislation, as well as any other attempt to surrender our sovereignty. It is time to put America First. It is time to stop funding the United Nations' anti-America agenda. Pull the plug now, or else!